The author's book discusses the causes, beginning with the foundational cause that is artificially low interest rates set by the Federal Reserve, the central bank. 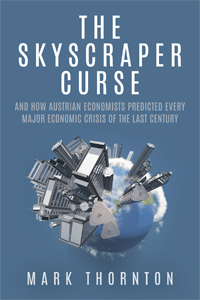 This is a "must read" book, especially by any person who does not understand or has not heard of the Austrian business cycle theory ("ABCT"). Unless one understands the ABCT, he or she cannot understand the primary and secondary causes of a boom and why a bust must follow. Without understanding the ABCT, a person is subject to false and misleading (branches and leaves) reasons given by the mainstream. And the mainstream exists to perpetuate the causes of the mainstream, as many people are learning. The mainstream in economics consists of Keynesians who follow the principles of John Maynard Keynes. The cause of busts, according to Keynes, who was not a trained economist, was "animal spirits" of people—showing he had no clue either of the causes of booms or the following necessary busts. So when a crash (bust) comes (actually several crashes), like the real estate crash in 2008, the mainstream will spew out false and misleading reasons. Some of the specific parties of the mainstream include: the Federal Reserve, the U.S. Treasury and federal government, college and university economics professors, asset managers, bankers, and especially the news media, including the financial news media. Read this book so that you will not be one of the millions who is duped when the next crash hits; and it certainly is coming. The powerful (controlling) mainstream will provide propaganda as the reasons for a crash(es) not to help the public but to retain their control.